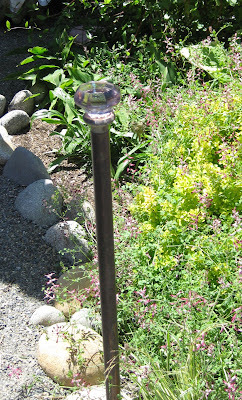 Last summer I was lucky enough to visit the Seattle garden of Lorene Edwards Forkner. It was an eye-opener to me; full of wonderfully handcrafted unique features, this garden was a treasure trove of ideas and I didn't know where to look first. Lorene's self-described 'urban hillbilly chic' was right up my alley garden path. 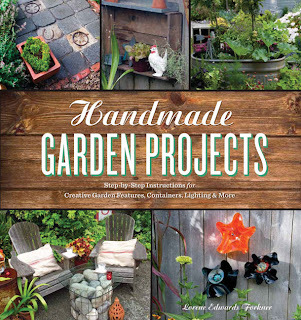 I was truly excited when I heard that many of the projects were going to be included in her soon-to-be released book Handmade Garden Projects, published by Timber Press. I ordered a copy as soon as I could and found even more than I hoped for. 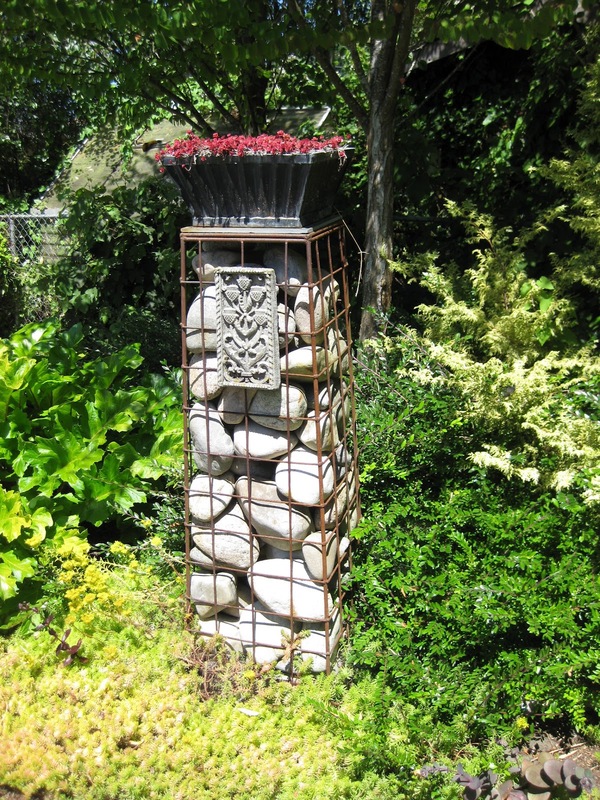 Directions for making things ranging from a gabion style cocktail table (made in the same style as the tower seen in her front garden, at top) to the mosaic patio accent circles, seen in the upper part of her back garden, were explained in detail. I love to put old items, be they vintage or simply old, to good use in my garden and this book motivated me to start actually doing something with all the 'good stuff' I had backing up in the garage. One of the best parts was seeing that many of the projects could be done quickly and didn't require lots of experience, although there are some more difficult construction items too. And, a really big plus for me, many of the projects don't take a large amount of space, but supply clever personal touches that can be tucked into an already crowded small space. The practicality of things like the hose guide topped by a vintage glass doorknob had me running to find the couple I had tucked away. 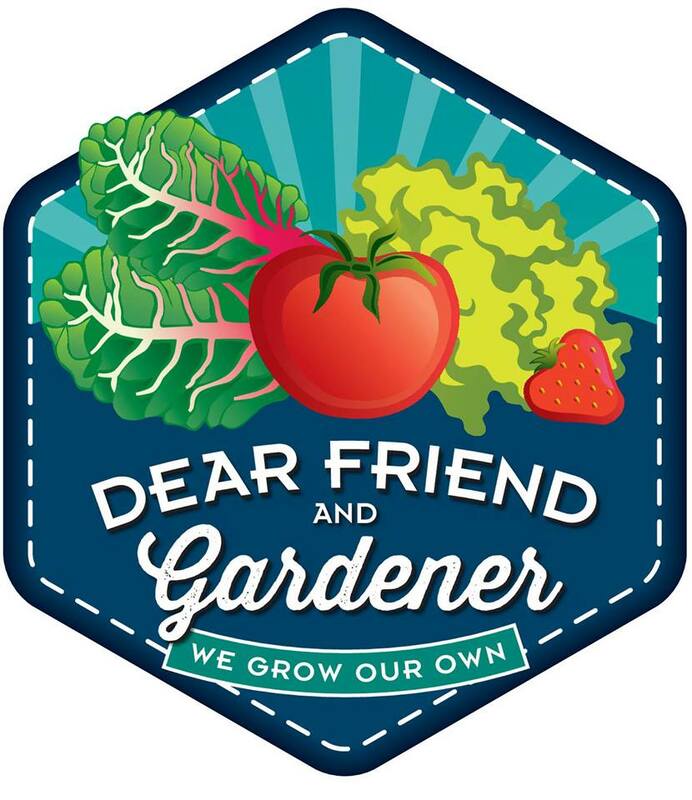 All the ideas are great jumping off points for making your garden truly yours. Great style, eco-friendly, and easy on the budget, leaving that much more money for plants! Now you can own a copy of this book too. Just leave a comment here by Sunday, May 20, and I will use a random number generator to choose one person to receive a copy, courtesy of Timber Press. Share on Facebook, Twitter, or Google+, leave a comment here letting me know that you did, and you'll get another chance to win...up to four chances if you share on all three. Pretty soon you'll be clearing out that cache of 'must be good for something' stuff and your garden will be showing off your personal style! Those pictures do remind me of your style! Looks cool. Wiete and I walked through Winters a week ago, and I noticed some unique garden art there, too. 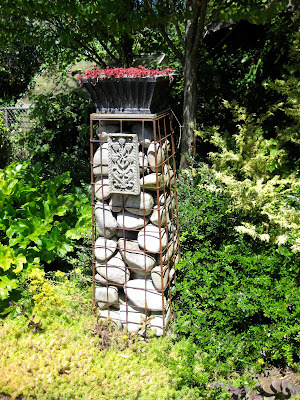 It seems like this kind of garden art arises organically in all sorts of garden, from people like Nancy who love to make something beautiful from things that others might discard. Thank you so much for the opportunity to own this wonderful book!! Great book, isn't it?!? It was such a treat to visit her garden. Haven't seen the book yet but really must find a copy! Loved your projects, especially the stone circle. I have whiskey barrel rings and have been trying to come up with ideas. Thanks for the great post. 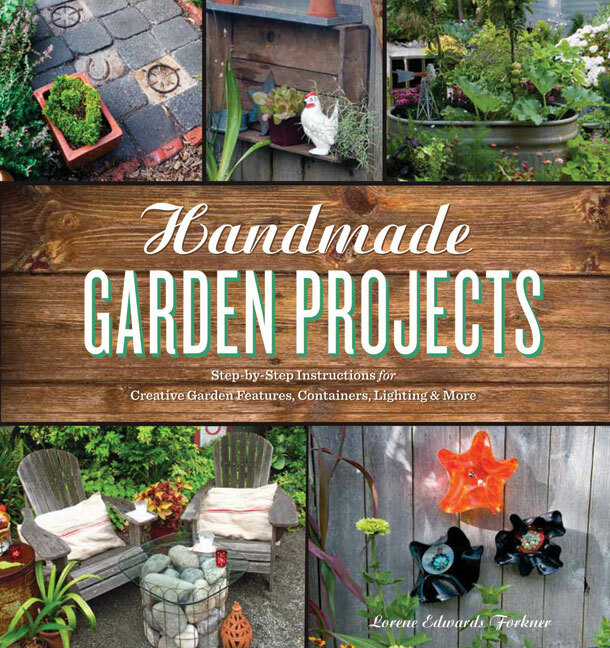 This book would be an awesome gift for my grandma, she is the kind of person that does that crafty garden stuff. I'd love to win this book. 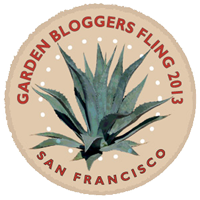 I enjoy repurposing my flea market finds for items in the garden and potting shed.Looks like some fantastic ideas. I enjoyed her garden as well. It was great to see your impressions of it.